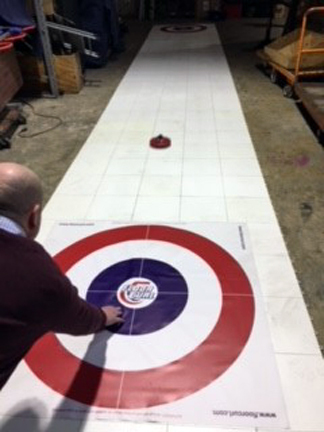 Rent Floor Curl - Floor Curling - Perfect for winter events - Our portable floor curl court is easy to set up and fun for all ages. Includes white base floor, 2 vinyl target mats, 8 ball bearing "stones" 4 cue sticks, and attendant. Floor Curl - A Winter Olympics fan favorite! Our portable, ice-less floor curl court is easy to set up and fun for all ages. Includes white base floor, 2 vinyl target mats, 8 ball bearing rolling "stones", game rules, cue sticks, and attendant. A great way to introduce people to the sport of curling. Requires: 33'l x 5'w space for court, plus standing area.